Funded by Tokio Marine & Nichido Fire Insurance Co., Ltd., Japan since 2011, this project aims to rehabilitate degraded mangrove area in Sabah with mangrove and associated species. The project is carried out by the Sabah Forestry Department with technical advice from ISME in terms of site selection and preparation, and monitoring of survival and growth performance. As of 2016, a total area of 357 ha has been planted with more than 13 mangrove and associated species. Japanese volunteer high school students and Tokio Marine & Nichido Fire Insurance Co., Ltd. staff also participated in the planting activities in March and September 2012, respectively. Funding by：Tokio Marine & Nichido Fire Insurance Co., Ltd. 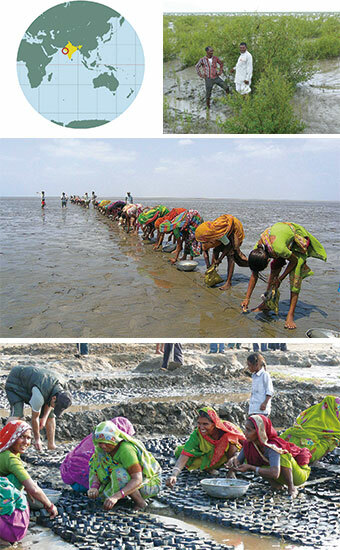 Located at the estuary of Sabarmati near Vadgam in Gujarat, India, the project aims to establish mangrove plantations for coastal protection, to enhance mangrove biodiversity including habitats for endangered birds and to generate income for the local community, especially the womenfolk. Daheda Sangh, a local NGO, carries out the planting activities together with the local community. Headed by Prof. S. Baba, the Executive Director of ISME, the project is conducted in collaboration with Dr. A. Untawale (Chief Technical Advisor) and Dr. Bharat Jethva. Project is funded by Tokio Marine & Nichido Fire Insurance Co., Ltd., Japan since 2009. Kiribati is one of several island countries of the Pacific facing the serious threat of sea-level rise. 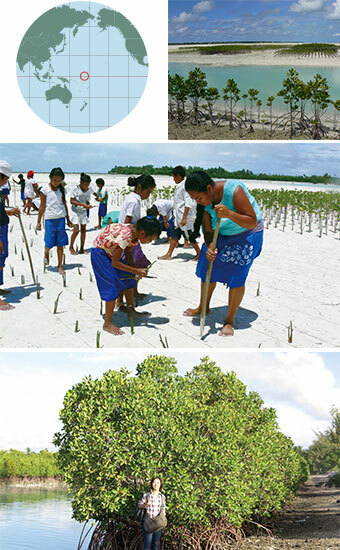 Since 2004, ISME has been implementing a mangrove rehabilitation project in Tarawa, Kiribati. The objective of this project is to introduce mangrove planting techniques to the local community and plant mangroves together with children for environmental education purpose. The project is financed by Cosmo Energy Holdings Co., Ltd., Japan and implemented by ISME with strong support from the Ministry of Environment Lands and Agriculture Development, and the Ministry of Education, Youth and Sports of Kiribati. Together with the National Institute for Environmental Studies (NIES), ISME have been compiling various information on coastal ecosystems in the tropics and subtropics. 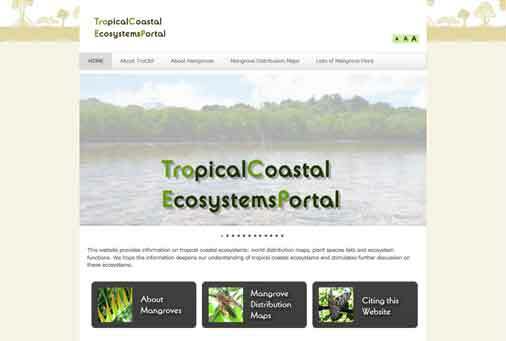 A part of these information is made available through the newly launched portal site, called ‘Tropical Coastal Ecosystems Portal (TroCEP).’ TroCEP will provide current issues on tropical coastal ecosystems. As the first step, the portal will provide information only on mangroves, but it will be extended to coral reefs and seagrasses. TroCEP includes tables of species distribution, compiled based on various data sources such as scientific papers, books, reports, webs, field confirmation and personal communications. The tables are still in progress, and more work is needed to generate accuracy especially where less documentation is available. Your inputs are welcome. Please visit the site and send your input to "trocep" (add "@mangrove.or.jp") . NIES and ISME hope that these information will be utilized widely for the purpose for education and further research on coastal ecosystems, especially by students who wish to study coastal ecosystems. 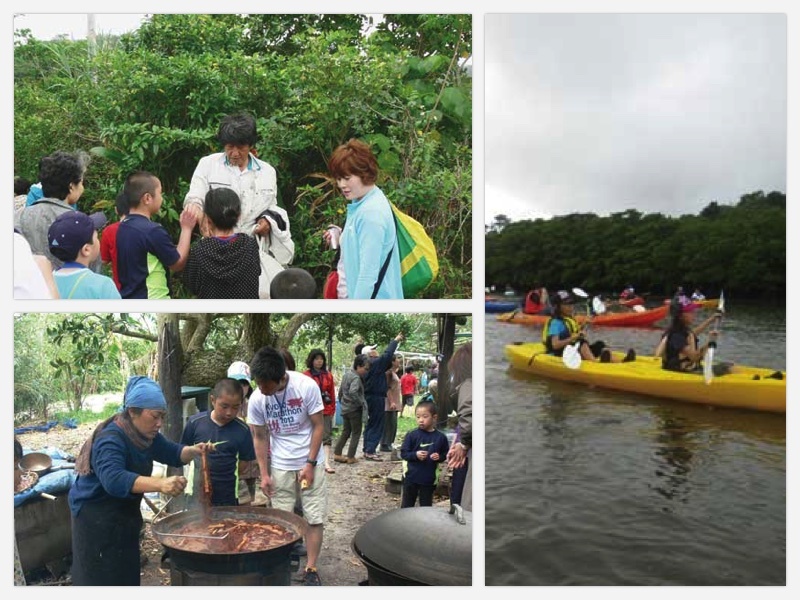 ISME organizes environmental study tours in Iriomote, Japan, for elementary school children who have won prizes for their essays and paintings on the environment since 2009. Over a period of three days, the children gain knowledge and experience on the importance of nature and conservation of the environment. Activities include boat tour and kayaking through mangrove forests, learning fabric dyeing using mangrove bark, and snorkeling to see the underwater world. This project is funded by The Asahi Shimbun Company and Tokio Marine & Nichido Fire Insurance Co., Ltd., Japan. 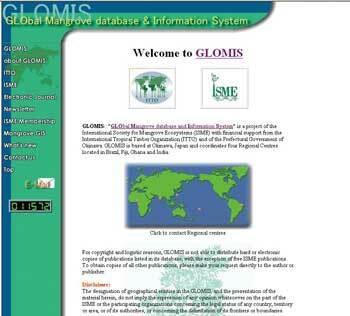 GLOMIS is a searchable on-line mangrove database that was developed by ISME and funded by ITTO from 1997-2006. 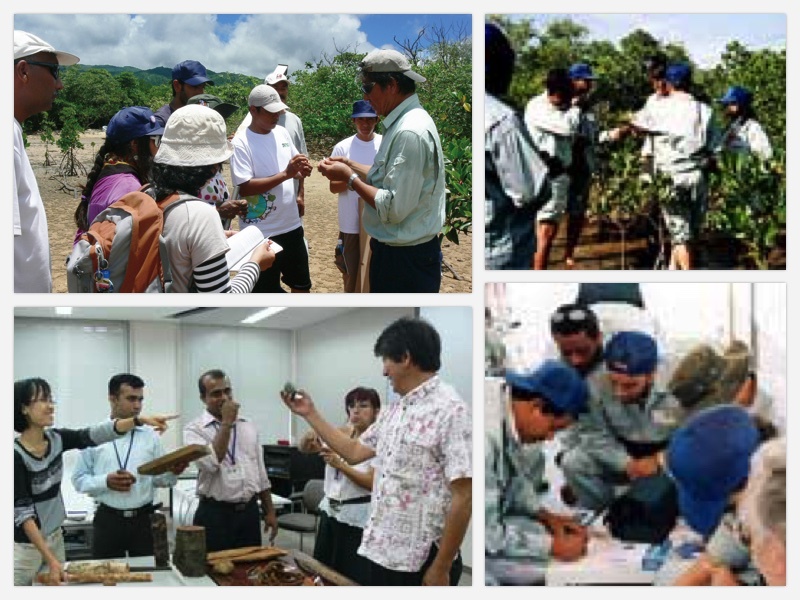 The idea was developed in 1996 as the very first tool of its kind that allows for easy access to mangrove-related information received around the world. The information is continuously updated after the completion of the project. The data are collected from ISME’s four regional centers (Malaysia, Fiji, Ghana and Brazil) as well as Okinawa headquarters. More than 8,400 records are disseminated through the internet and also available in a stand-alone CD-ROM. From 1995 to 2012, ISME has implemented two annual training courses funded by Japan International Cooperation Agency (JICA). The courses are Conservation and Sustainable Management of Mangrove Ecosystems since 1995 and Environmental Education for Sustainable Development - Conservation of Coastal Ecosystems for Lives of Local Communities since 2005. A total of 117 trainees from 38 countries of Africa, Middle East, Asia, Pacific, North and South America regions participated in the mangrove training course and a total of 84 trainees from 28 countries participated in the environmental education course. The Republic of Maldives, consisting of some 1,190 small islands in the Indian Ocean, is exposed to the threats of sea-level rise. With supports from the Maldives Government, ISME implemented a planting project in several islands from 2000-2003 to help mitigate coastal erosion. From 2006 to 2009, another project was carried out to restore the coastal forests destroyed by the 2004 Indian Ocean Tsunami. 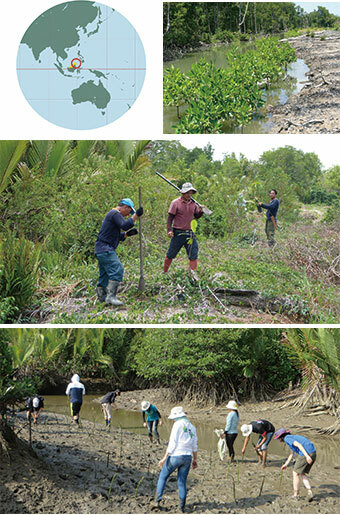 Some coastal tree species including mangroves were raised in a nursery for planting along the coast together with local communities. 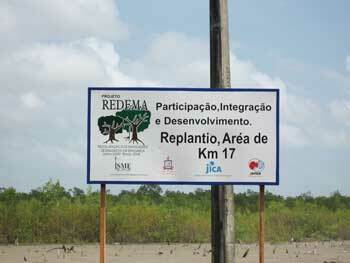 The projects were funded by the Japan Fund for Global Environment. In Bragança, Para State of the northern Brazil, construction of roads caused hydrodynamic changes in the coastal regions, and consequently, large areas of mangrove forests were degraded in the last two decades. 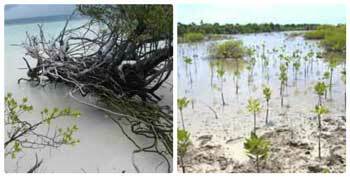 Japan International Cooperation Agency (JICA) funded a three-year project (2005-2008) to restore the degraded mangrove forests and develop education materials to enhance public awareness of the importance of mangroves. The project was supported and participated by the local communities in Bragança, and collaborated with Federal University of Para (UFPA) - Bragança Campus, Museu Emilio Goeldi, and Mangrove Dynamics and Management (MADAM).